I recently saw this Made In Hell-A "Praduh" T-shirt, and just had to have it. Bamboo Sky was sold out, so I ordered directly from the company. Took more than a week and a half to receive it, but I finally got my hands on it! Picturing what I would wear with it for weeks, I chose this infamous Zara zigzag skort and a Express cardigan for a simple look. 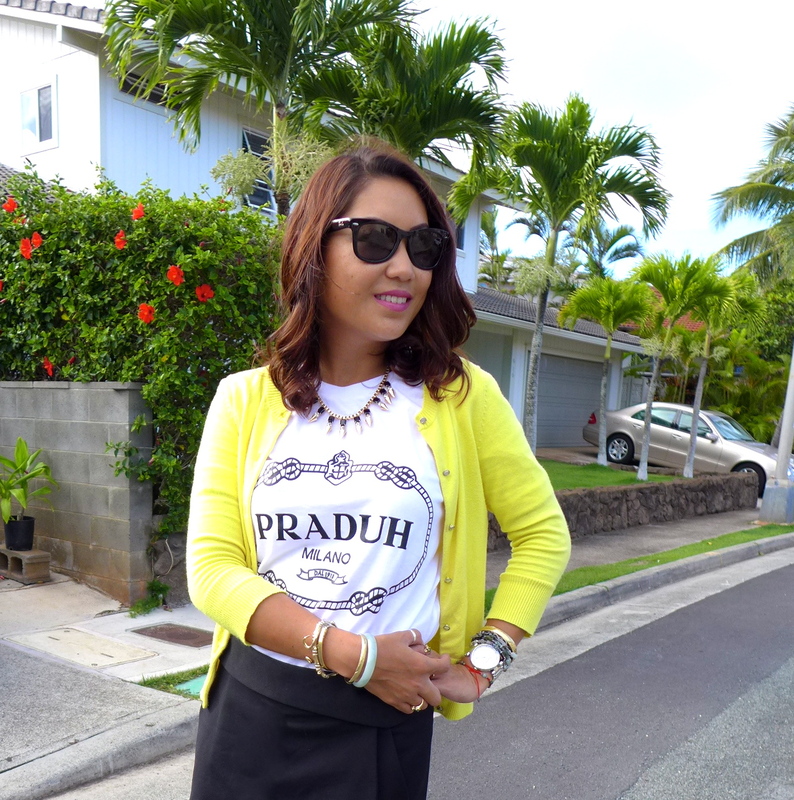 I wanted the Praduh shirt to stand out the most. Duh! Zara lace-up heels and my best accessory, my Lab! Ugh. I need that shirt. DUH. Love it, Kim. we're getting more in babe! and it think hubby can fit too. matchy matchy!!! What size did u order? Does it fit TTS? we're getting more i soon. stay posted on our instagram babe! btw kim, you're doing an amazing job on your blog! i love your honest opinion about the restaurants you try and I'm so grateful for the bamboo sky plugs! i love your blog, and even when I don't comment as much as I should, just know that I'm very lazy. (clearly you can tell by my lower case i's) but i visit often!! !